Teaching abroad is a great way to see the world and a rewarding opportunity to affect people’s lives in a positive way. ESL teacher, Janice explains why she decided to teach abroad and how her experiences teaching English in China gave her the opportunity to travel and make a difference in the lives of her students. 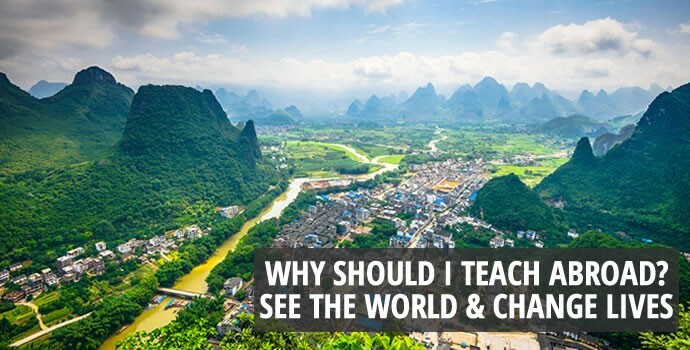 Want to learn more about opportunities to Teach abroad? Visit a free information session near you or download our free course guide. Hi, I’m Janice and I taught in a high school in China. I’d never really thought much about going overseas before it actually happened. I was in Teacher’s College and worked quite a lot with ESL students while I was doing that and really enjoyed the experience. After I finished college and was back home living with my parents, I was pretty desperate to find a job and get out of the house, and I saw this posting for a school in China that needed a teacher right away. So I threw in my application and about 3 weeks after that I was in the country and teaching at their school. It was really an amazing experience and I had a lot of opportunities to travel and see the country. One of the things I remember the most was when I got to see the Terracotta Army. I’d always loved history, studied a lot of archeology and ancient civilizations when I was in school and so the opportunity to see that was very exciting for me. It is located at one of their ancient capitals, Xi’an, and it’s just absolutely unbelievable when you see them in real life. They’re life-sized, individualized statues of all these warriors that have completely different facial expressions, and you just can’t really comprehend it from photos or videos that you see until you’re actually right there looking at them. Teaching, I found, was a very rewarding experience, and every day you have the opportunity to influence and affect someone’s life in a positive way. Teaching overseas, you really feel you are having a global impact. You’re learning their culture but also teaching them about yours. The students mostly wanted to study in North America whenever they were finished high school. They wanted to come here for university and college, and knowing that I was helping them fulfill that goal really meant a lot.